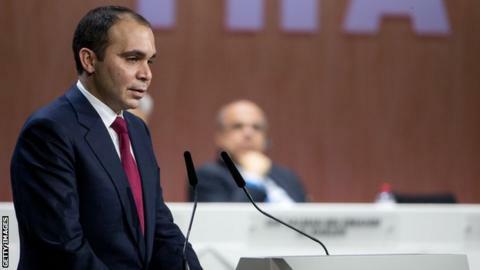 Fifa presidential candidate Prince Ali bin al-Hussein wants Michael Garcia's report into allegations of World Cup bidding corruption to be published now. Garcia resigned as Fifa's independent ethics investigator in protest at the handling of his report into the bidding for the 2018 and 2022 World Cups. The full report may not be made public until Swiss authorities conclude a criminal investigation. Prince Ali said: "People need to know what has been going on at Fifa." The Jordanian said football's world governing body needed to have some "basic norms", which included the immediate publication of the Garcia report. After former US prosecutor Garcia submitted his findings in September 2014, Fifa released a 42-page summary that cleared Russia and Qatar - the next two World Cup hosts - of corruption. Garcia resigned, claiming that summary was "incomplete and erroneous". Prince Ali is one of five candidates to succeed Sepp Blatter as Fifa president, along with Jerome Champagne, Gianni Infantino, Sheikh Salman bin Ebrahim al-Khalifa and Tokyo Sexwale. The election will take place at Fifa's extraordinary congress in Zurich on 26 February. Read more on Where does your club rank in the Christmas jumpers league table?